Glowing, radiant skin is what we girls all aim at on these wonderful summer days. Having shed away all our winter disguises, we are ready to bare ourselves and flaunt our perfect complexion. As the summer weather with all that extreme temperatures and humidity can take its toll on your skin, causing premature wrinkles, dryness and pigments, it’s crucial to get armed with easy but helpful recipes on how to take care of skin in summer. Here you go! This should be your first step, both logically and naturally. Cleansing your face and body with the products designed specifically for your skin type should become one of your favorite summer routines, twice a day. It helps you prepare your skin for a wonderful moisturizing session as well as preventing nasty acnes that can suddenly appear all over during the summer season. Another regular technique for perfect skin, exfoliation for removing dead skin cells can be done once a week in winter, but summer dictates its own rules! Choose an organic body scrub of your liking and apply it in circular movements 2-3 times a week during summer days. If you want to know how to take care of skin in summer even more effectively, try rubbing a scrub into your dry skin before turning on a shower, paying extra attention to your knees and elbows. In summer, hair removal becomes the most urgent issue. Instead of using safe razors however, you should rather go for a method that neither burns nor dries your skin. My personal choice is waxing or, better, sugar waxing to keep your skin smooth, pampered and well-moisturized. Another reason for going razor-free is to irritate your skin less with shaving, since you will have only 2-3 waxing sessions in the entire summer. Stocking up a rich moisturizing lotion, body oil or butter ensures you will do a perfect job of keeping your body hydrated. As so much humidity is going to evaporate from your skin, you should ensure you restore the healthy level. Wondering how to take care of skin in summer, you are sure to be tempted with sunless tanners. There is no reason not to do that – first, because it would be a perfect start of the bare-skin season; and second, because good tanners moisturize and care for your skin at the same time (watch out for special tinted moisturizers). 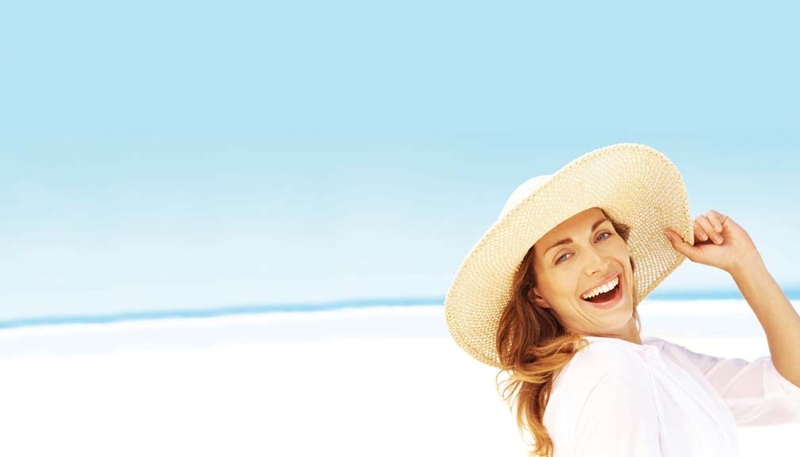 Any time you go out or sunbathe, make sure your skin is well protected with a proper sunscreen. Use sunscreen products carefully and don’t go out between 10 am and 3 pm, for this is the time when the sun is most radioactive and can easily burn your gentle skin. For your vulnerable scalp and hairline, use sunscreen sprays instead of creams, and generally go for a light, less oily formula with SPF 50 or higher. The nature cares for your skin as well, which means you can choose sea bathing as another treat for your skin! Sea water is rich in minerals, so providing that you apply a proper after-care such as cleansing with organic soaps and moisturizing, your skin will soon become soft, elastic and glowing from the inside. And you will need them a lot after a hot day’s walk. Our advice on how to take care of skin in summer would be to go for cold showers instead of hot ones, as the latter may cause higher dehydration of your skin and aggravate the sunburns you may already have. In the summer, antioxidants are absolutely must-haves both in your diet and skincare products. You’d be surprised but treating yourself to a glass of red wine is one of the ways to supply yourself with necessary antioxidants! You should choose the pieces of clothing and accessories that can best protect you from the sunlight and be least harsh for your skin. Elegant headpieces with a wide brim would be ideal for protecting your face by keeping it in the shadow, while light-colored, 100% cotton clothes work most gently on a hot day. Not all your skin is the same, so you have to differentiate how to care for your body, face, lips, hands and feet. For face, in particular, keep a separate tube of a gentler scrub and a special sunscreen powder to block UV light without messing up with your make-up. Also, be particular about your face skincare products that are aimed at blocking acne breakouts. For lip care, don’t forget to use a balm with SPF 15 or higher. This will keep your lips hydrated and prevent drying out – which occurs much faster (and more visibly) with your lips than with any other part of your body. The logic behind caring for your hands and nails should be the same – just keep them well-moisturized and apply sunlight blocking products. For nails, it’s important to choose a sunscreen nail polish (of course, the one that will generously highlight your tanned skin). Scrub off dead skin, moisturize with your favorite feet lotion, and get prepared for walking the beach like a free-spirited fairy! Well, it’s a bit off the mark, but knowing how to take care of skin in summer – even if it’s just your feet – can keep you from excessive sweating and make you feel much more comfortable. You can get vitamin D from the sunlight, but such vitamins as C and E should be supplied from your food and drink. They are known to work as sunscreens and can keep you from getting sunburn. Also, carrots, cucumbers, watermelons, cantaloupes and other juicy vegetables and fruits are ideal for keeping a healthy water balance in your body. Server responsed at: 04/19/2019 10:57 p.m.